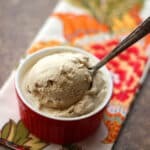 Cafe con Leche Ice Cream ~ rich, creamy, coffee flavored ice cream. Just sweet enough to take the bitterness out of the coffee, without so much sweetness as to be overwhelming and cancel the richness of the coffee. Everything about this recipe makes me grin. While it hasn’t been a hardship to play with my new ice cream maker, a rich and creamy coffee flavored ice cream almost became my nemesis this past week. 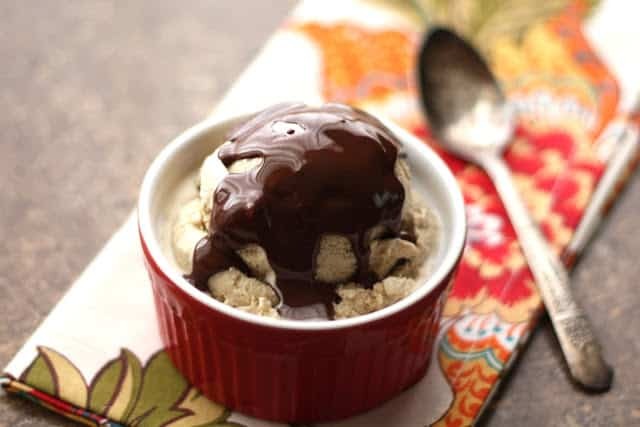 I made no less than five versions of coffee ice cream, before I realized that the rich and creamy ice cream I wanted just wasn’t going to happen without eggs. I tend to be more of a “throw it in the machine with minimal time invested” kind of ice cream maker. Most of the time, if you balance the ingredients right, it works well that way. However, I wanted all the flavor of my beloved Cafe con Leche to be dominant in this ice cream. Unfortunately, adding a cup of brewed espresso meant that I was basically adding a cup of water to the ice cream. All of the variations I kept trying were turning out crystallized and more icy than creamy. I tried versions using just espresso powder and cream, versions with combinations of both; basically, if you could think of a way to make this without the eggs, I tried it. No luck; for the flavor I wanted, eggs were required. The ten minutes spent cooking the custard base for this ice cream is so completely worth the time and effort, I can not encourage you enough to try it. I rarely choose a custard based ice cream over a Philadelphia style recipe, both for the taste and for the time spent. However, this ice cream is exactly the coffee ice cream I craved. I already know that this is going to be my special occasion ice cream for years to come! Pour the hot espresso over the sugar and salt in a sauce pan over medium heat. Stir to dissolve the sugar. Add the cream and stir again. 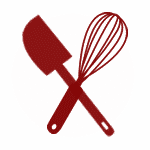 Lightly whisk the egg yolks and slowly pour them into the espresso mixture, whisking constantly. Stir constantly while warming the mixture over medium heat. Continue stirring until the mixture thickens slightly and coats the back of a spoon, this should take about 10 minutes. Combine the half and half and vanilla in a medium size glass bowl and pour the warm mixture into the cream. Stir to combine and then place in the refrigerator. Chill for at least 6 hours, preferably overnight, before freezing according to your ice cream maker's directions. Serve immediately for soft-serve ice cream or store in an airtight container and freeze for a couple of hours for a firmer ice cream. Serve with Chocolate Sauce if desired. Enjoy! Mmm. Another beautiful and tasty looking ice cream. I never bothered with the whole custard and egg yolk thing with ice cream before, but I HAVE TO now...coffee ice cream is the best thing in the world, but it is usually a little icy. I can't wait to try this! This has got to be the perfect ice cream. Yep it must be! Anything con leche is delicious. Of course, there are no calories in this, correct?! I suppose it would behoove me to crank this in an old fashioned ice cream maker......not! 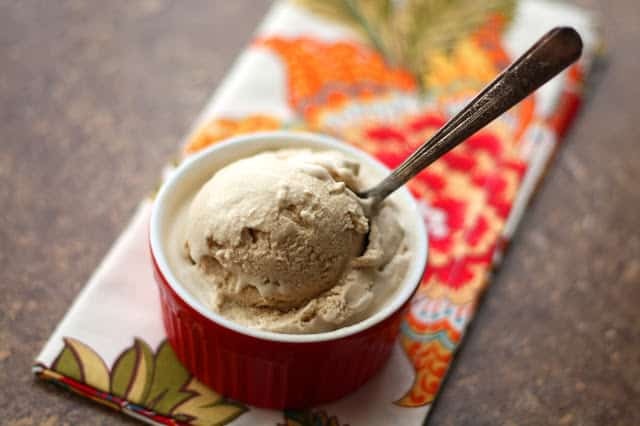 Real, homemade coffee ice cream IS the gift of the gods! It doesn't say to over with plastic to prevent a skin from forming. I understand that you don't want the condensation before it cools off, but still wonder about a skin forming. It doesn't say to *COVER with plastic. Sorry. I've never had an issue with it. It should work fine either way.